Snickers case studies: we currently have 5. In summer 2015, Snickers launched another iteration of its ‘You’re Not You When Your Hungry’ campaign, this time featuring Mr Bean for a funny martial arts adventure. During the campaign Mars UK tested a mix of TV and online video (specifically YouTube) to determine if the media plan was optimised to drive the most in-store sales. In another fun take on the brand’s slogan, Snickers got famous YouTubers to post bad videos showing how hunger can affect performance. Snickers - Twitch from Sei Rey Ho on Vimeo. This example of data capture inside an advertising space is a good way of showing how brands can build lists and email addresses of prospects without needing them to visit the website. 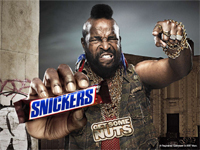 In this particular example, the confectionery brand Snickers uses mobile marketing as a way of sending messages between friends that are from their brand spokesperson – Mr T. The messaging is customised by name and gives the person who triggers the message a range of options. A neat way of reaching into social networks and getting people with mobiles to forward the brand message to their friends.